Mobile Suit Gundam(Japanese:機動戦士ガンダム, Hepburn:Kidō Senshi Gandamu, also known as First Gundam, Gundam 0079 or simply Gundam '79) is a televised anime series, produced and animated by Sunrise. Created and directed by Yoshiyuki Tomino, it premiered in Japan on Nagoya Broadcasting Network and its affiliated ANN stations on April 7, 1979, and lasted until January 26, 1980, spanning 43 episodes. It was the very first Gundam series, which has subsequently been adapted into numerous sequels and spin-offs. Set in the futuristic calendar year "Universal Century" 0079, the plot focuses on the war between the Principality of Zeon and the Earth Federation, with the latter unveiling a new giant robot known as the RX-78-2 Gundam piloted by the teenage civilian mechanic Amuro Ray. 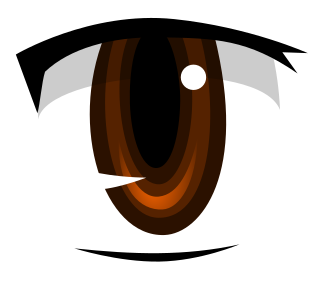 Anime is hand-drawn and computer animation originating from or associated with Japan. Yoshikazu Yasuhiko is a Japanese animator, manga artist, and occasional director in the anime industry. Bandai Co., Ltd. is a Japanese toy maker and a producer of a large number of plastic model kits as well as a former video game company. It was the world's third-largest producer of toys in 2008 after Mattel and Hasbro. Some ex-Bandai group companies produce anime and tokusatsu programs. Its headquarters is located in Taitō, Tokyo. Gundam models are model kits depicting the vehicles and characters of the fictional Gundam multiverse by Bandai. These kits have become popular among mecha anime fans and model enthusiasts in Japan and in other nearby Asian countries since the 1980s. Gundam modeling spread in the 1990s with North America and Europe being exposed to Gundam through television, video and manga. Gundam models, as well as the hobby of assembling and painting them, is known in Japan as Gunpla, a portmanteau of "Gundam plastic model", plastic being the most common material for the retail kits. The story begins with a newly deployed Federation warship, the White Base , arriving at the secret research base located at the Side 7 colony to pick up the Federation's newest weapon. However, they are closely followed by Zeon forces. A Zeon reconnaissance team member disobeys mission orders and attacks the colony, killing most of the Federation crew and civilians in the process. Out of desperation, young Amuro Ray accidentally finds the Federation's new prototype arsenal—the RX-78 Gundam, and manages to beat back Zeon forces. Scrambling everything they can, the White Base sets out with her newly formed crew of civilian recruits and refugees in her journey to survive. The SCV-70 White Base, called The Trojan Horse by Zeons, is a fictional spaceship from the Japanese science fiction anime series Mobile Suit Gundam. It serves as the mothership of the protagonist crew members and the famous mobile suit Gundam. Various spin offs are designed after it, including a whole class of ships called the Pegasus-class assault carrier, and it has inspired ships in the sequels like the Argama class in Mobile Suit Zeta Gundam and Archangel class in Mobile Suit Gundam SEED. The RX-78-2 Gundam is a fictional manned robot (mecha), introduced in 1979 in Yoshiyuki Tomino's and Sunrise's anime series Mobile Suit Gundam. In the series, it is a prototype weapon for the Earth Federation when it falls into the hands of Amuro Ray, the son of its designer in story, who goes on to pilot it in the Earth Federation's war against the Principality of Zeon. Char Aznable, born Casval Rem Deikun and also gone by the name Édouard Mass, is a fictional character from the Gundam franchise. He is originally one of the main antagonists in Mobile Suit Gundam working for the Principality of Zeon, named after his late father Zeon Zum Deikun, with the honorary title of "The Red Comet" during Gundam's One Year War. Despite having opposed Earth Federation soldier Amuro Ray several times, in the sequel Mobile Suit Zeta Gundam he becomes Quattro Bajeena, an Anti-Earth Union Group (AEUG) pilot fighting alongside the series' main characters against the elitist Titans. In his final appearance in Char's Counterattack, he assumes leadership of the Neo Zeon movement, and becomes the titular antagonist of the film. 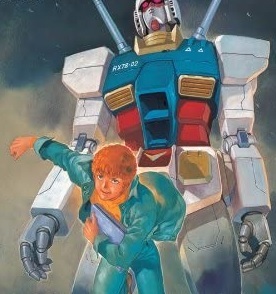 In February 1980, Mobile Suit Gundam was aired in Italy, the first country to broadcast the show outside Japan. Mobile Suit Gundam was also later aired by the anime satellite television network, Animax, across Japan, with the series continuing to be aired on the network currently, and later its respective networks worldwide, including Hong Kong, Southeast Asia, South Asia, and other regions. Hoping to capitalize on the success of Gundam Wing from the previous year, Bandai Entertainment released a heavily edited and English-dubbed version of Mobile Suit Gundam, premiering on Cartoon Network's Toonami weekday afternoon after-school action programming block across the United States on Monday, July 23, 2001. The series did not do as well as Wing but the ratings were high enough for the whole series to be aired and to spawn an enormous toy line. Due to the September 11th attacks, Cartoon Network, like many other American TV stations, began pulling, and editing, war-themed content and violent programming, resulting in the cancellation of the series. However, the series finale was shown as part of Toonami's "New Year's Eve-il" special on December 31, 2001  and the unaired episodes were aired in reruns during 2002. In both American TV showings and on the international DVD and Blu-ray release, episode 15 ("Cucruz Doan's Island") was cut out. According to Yoshiyuki Tomino, the removal was made at his request, with the episode becoming a "lost episode" of sorts, never being dubbed. The episode remained on the Japanese DVD and Blu-ray releases. 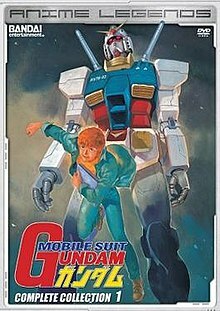 In 1979, before the end of the anime, Yoshiyuki Tomino himself created the first novelizations of the original Gundam anime series. The novels, issued as a series of three books, allowed him to depict his story in a more sophisticated, adult, and detailed fashion. Along with this adaptation came several major changes to the story. For example, Amuro is already a member of the Federation military at the time of the initial Zeon attack on Side 7, and the main characters in the Federation serve on the White Base-class ships Pegasus and Pegasus II rather than the Pegasus-class White Base. Additionally, the war continues well into the year UC 0080 in the novels, whereas it concludes at the beginning of that year in the anime series. In the novel Amuro Ray is killed in the final attack against the Zeonic stronghold of A Baoa Qu when his RX-78-3 is pierced through the torso by a Rick Dom's beam bazooka. This occurs as Char's unit attempts to warn him about Gihren's intention to destroy the fortress and take the Federation's offensive fleet along with it. Char and the crew of Pegasus II (White Base), along with handpicked men under Kycilia Zabi's command, make a deep penetrating attack against the Side 3 and together kill Gihren Zabi, after which Kycilia is killed by Char. Tomino later lamented that had he known that anime ending would be different and that another series would be made, he would not have killed off Amuro in the novels. The three novels were translated into English by Frederik Schodt and published by Del Rey Books in September 1990. At the time, there were no officially recognized romanizations of character and mecha names, and a variety of different spellings were being used in the English-language fan community. In the original three novels, therefore, Mr. Schodt wrote the name "Char" as "Sha." "Sha" is a transliteration of the Japanese pronunciation, although Mr. Tomino later publicly confirmed at Anime Expo New York 2002 that the name was originally based on the French name Charles Aznavour, a popular French-language singer. (The 2004 edition of the English translation revealed that Schodt felt that the "Char" rendering "seemed too close" to Aznavour's name.) He also rendered "Zaku" as "Zak," and (after consulting with Mr. Tomino) "Jion" as "Zeon," instead of "Zion," which was in use in some circles. Some North American fans, already attached to particular spellings, took great umbrage at Schodt's renditions, forgetting that in the original Japanese most character and mecha names are written in katakana , and that there were, therefore, no "official spellings." Many years later, when the Gundam series was finally licensed in North America, the rights holders came up with a unified list of "official spellings" for English-language material, and some of these spellings include Schodt's renditions, as well as the renditions to which certain North American fans were attached. The series was the first winner of the Animage Anime Grand Prix prize, in 1979 and the first half of 1980. In the top 100 anime from Animage, Gundam was twenty-fourth. The magazine Wizard listed the series as the second best anime of all time. By the end of 2007, each episode of the original TV series averaged a sales figure of 80,928 copies, including all of the different formats it was published in (VHS, LD, DVD, etc.). The first DVD box set sold over 100,000 copies in the first month of release, from December 21, 2007 to January 21, 2008. As part of the 30th Anniversary of the Gundam series, the company officially announced a project on March 11, 2009 called Real-G, a plan to build a 1:1 real size scale Gundam in Japan. It was completed in July 2009 and displayed in a Tokyo park then taken down later. The 18-meter tall statue was reconstructed in Shizuoka Prefecture and was taken down in March 2011. In August 2011 it was dismantled only to reopen in Odaiba, Tokyo on April 19, 2012. It stood Odaiba along with a gift shop called "Gundam Front Tokyo" until it was dismantled in March 2016. Yoshiyuki Tomino is a Japanese mecha anime creator, animator, songwriter, director, screenwriter and novelist. He was born in Odawara, Kanagawa Prefecture, and studied at Nihon University's College of Art. He is best known for creating the Gundam anime franchise. Mobile Suit Gundam: Char's Counterattack is a 1988 anime film set in the Universal Century timeline of the Gundam franchise. Mobile Fighter G Gundam, also known in Japan as Mobile Fighting Legend G Gundam, is a 1994 Japanese animated television series produced by Sunrise and the fifth installment in the long running Gundam franchise. The series is set in the "Future Century", where space colonies representing countries have agreed to hold an organized fighting tournament known as the "Gundam Fight" every four years to settle their political differences in place of war. Each colony sends a representative fighter piloting a giant, humanoid mecha called a Gundam to battle on Earth until only one is left, and the winning nation earns the right to govern over all the colonies until the next tournament. The events of G Gundam follow Domon Kasshu, the pilot of Neo Japan's Shining Gundam during the 13th Gundam Fight. Domon's mission is to both win the tournament and to track down his older brother, who is believed to have stolen the mysterious Devil Gundam from the Neo Japan government. Mobile Suit Gundam 0080: War in the Pocket is a six episode 1989 Japanese science fiction original video animation series. It is the first OVA series in the Gundam franchise. It was directed by Fumihiko Takayama, written by Hiroyuki Yamaga with character designs by Haruhiko Mikimoto. Mobile Suit Gundam: Hathaway's Flash is a series of novels created and written by Yoshiyuki Tomino. Officially part of the Gundam metaseries, it was first published by Kadokawa Shoten under the Kadokawa Sneaker Bunko label from February 1, 1989 to April 1, 1990 with a total of three volumes. The story revolves around Hathaway Noa, who now goes on the name Mufti, as he starts a terrorist group to stop the abuses of the Earth Federation. The novel is notable for being the only semi-canonical Gundam work by Tomino. A three-part theatrical film adaptation was formally announced by Sunrise as part of the "UC NexT 0100" project, with the first film to be released on Q4 2019. Mobile Suit Gundam: The Origin is a manga written and illustrated by Yoshikazu Yasuhiko. It is a retelling of the story from the 1979 anime television series Mobile Suit Gundam, of which Yasuhiko was the original character designer. Mobile Suit Gundam 00 is an anime television series, the eleventh installment in Sunrise studio's long-running Gundam franchise comprising two seasons. The series is set on a futuristic Earth and is centered on the exploits of the fictional paramilitary organization Celestial Being and its efforts to rid the world of war and conflict with a series of unique and extremely advanced mecha mobile suits known as "Gundams". Mobile Suit Gundam Thunderbolt is a Japanese manga series written and illustrated by Yasuo Ohtagaki. The manga takes place in the Universal Century timeline during and after the events of Mobile Suit Gundam. The manga is published by Shogakukan in Japan, with the English version licensed by Shogakukan Asia in Southeast Asia and Viz Media in North America. An ONA series adaptation by Sunrise was released between 25 December 2015 and 8 April 2016. A second season of the ONA series adapting the second arc of the manga was released between 24 March 2017 and 14 July 2017. Mobile Suit Gundam: Twilight AXIS is a Japanese light novel series written by Kōjirō Nakamura and illustrated by ARK Performance, released by Sunrise under the Yatate Bunko imprint. It is set after the events of Mobile Suit Gundam Unicorn and before the events of Mobile Suit Gundam F91, in which it focuses on two former Zeon remnants as they were hired to investigate the remains of the asteroid base Axis. The novel is loosely based on Richard Wagner's Opera Tristan und Isolde. 1 2 3 4 "Q&A with Yoshiyuki Tomino". Anime News Network. September 14, 2009. Retrieved November 15, 2013. ↑ Tomino, Yoshiyuki (2004). Mobile Suit Gundam: Awakening, Escalation, Confrontation. Stone Bridge Press. p. 8. ISBN 978-1-880656-86-0. ↑ Stahl, David (2010). Imag(in)ing the War in Japan. BRILL. p. 335. ISBN 978-9004182981. ↑ "The Mike Toole Show Super Robot Island: Final". Anime News Network. November 18, 2012. Retrieved November 18, 2012. ↑ N. Hornyak, Timothy (2006). Loving the Machine: The Art and Science of Japanese Robots. Kodansha International. p. 64. ISBN 978-4770030122. ↑ "AntonioGenna.net presenta: IL MONDO DEI DOPPIATORI - ZONA ANIMAZIONE: "Gundam" / "Mobile Suit Gundam"". antoniogenna.net. ↑ http://www.rottentomatoes.com/m/mobile_suit_gundam_vol_1_the_battle_begins/ Rotten Tomatoes page of the first volume. ↑ "Bandai Ent. Adds 1st Gundam TV Series With English Subs". Anime News Network. October 9, 2010. ↑ "Mobile Suit Gundam Complete Collection 1: Anime DVD Region 1 US Import NTSC: Amazon.co.uk: DVD & Blu-ray". Amazon.co.uk. 1 2 "Sunrise Partners With Right Stuf to Release Gundam Franchise Stateside". Anime News Network. 2014-10-11. ↑ "Right Stuf, Sunrise to Release Original Gundam TV Anime on Blu-ray Disc". Anime News Network. 2015-07-03. Retrieved 2015-07-05. ↑ Tei, Andrew (28 September 2004) . "Yoshiyuki Tomino Panel – the daddy of Gundam!". Anime on DVD. Archived from the original on 18 October 2004. I asked that it would be skipped. There is a reason, but since the staff is still alive I can't answer it. It's a long story. ↑ Tomino, Yoshiyuki (2004). Mobile Suit Gundam. Berkeley: Stone Bridge Press. p. 11. ISBN 1-880656-86-8. ↑ Tomino, Yoshiyuki (2004). Mobile Suit Gundam. Berkeley: Stone Bridge Press. pp. 470–473. ISBN 1-880656-86-8. ↑ Clements, Jonathan (2017). Anime: A History. Bloomsbury Publishing. p. 167. ISBN 9781844578849. 1 2 "ガンダムで映画化された作品を振り返る". データガンダム (in Japanese). 2018-10-11. Archived from the original on 2018-12-15. Retrieved 2018-12-12. ↑ "1982年（1月～12月）". Motion Picture Producers Association of Japan. Retrieved March 5, 2018. ↑ "日本アカデミー賞にもノミネート 映画「ONE ＰＩＥCＥ」が超えた名作アニメ映画". Naver Matome . Naver. 2013-01-24. Retrieved 19 February 2019. ↑ "Mobile Suit Gundam Trilogy Anime Legends". store.bandai-ent.com. Archived from the original on July 9, 2010. Retrieved 2015-11-11. ↑ "Amazon.com: Mobile Suit Gundam Trilogy Anime Legends: Tôru Furuya, Hirotaka Suzuoki, Yoshiyuki Tomino: Movies & TV". amazon.com. ↑ 機動戦士ガンダム ： 誕生秘話描く「ガンダム創世」　タイトル一新しコミックス化 (in Japanese). Mantan. Retrieved January 27, 2013. ↑ Emerging Worlds of Anime and Manga, Volume 1. 2006. p. 175. ISBN 978-0816649457. ↑ "Wizard lists Top 50 Anime". Anime News Network. July 6, 2001. Retrieved 2014-02-02. ↑ "Anime Japan 2014". www.anime-japan.jp. Archived from the original on April 3, 2014. Retrieved 2015-11-11. ↑ Oppliger, John (June 24, 2008). "Ask John: Which Anime Have Been Ahead of Their Time?". AnimeNation. Archived from the original on August 30, 2008. Retrieved February 1, 2010. 1 2 John Oppliger (May 16, 2008). "Ask John: Why Are Gundam Fans So Obsessed With First Gundam?". AnimeNation . Retrieved May 30, 2008. ↑ "Animage Top 100 anime listing". Anime News Network. January 15, 2001. Retrieved December 23, 2013. ↑ "Wizard lists Top 50 Anime". Anime News Network. July 16, 2001. Retrieved December 23, 2013. ↑ "静岡の空をそめていく……実物大ガンダム公開直前リポート – ITmedia News" (in Japanese). July 7, 2010. Retrieved September 19, 2010. "Shizuoka ... full-scale Gundam"
↑ "Life-Size Gundam Rises Again at Tokyo's Odaiba in Video". Anime News Network . 2012-04-22. Retrieved 2012-05-04. ↑ "Giant 60-Foot 'Mobile Suit Gundam' Statue Presides Over DiverCity Tokyo Plaza (PHOTO)". Huffington Post . 2012-05-01. Retrieved 2012-05-04. ↑ Shepard, Chris (January 21, 2002). "Mobile Suit Gundam DVD 2". Anime News Network. Retrieved November 28, 2013. 1 2 Dong, Bamboo (January 27, 2002). "MS Gundam (Dub only) DVD Vol. 3: The Threat of Zeon". Anime News Network. Retrieved November 28, 2013. ↑ Wallis, J. Doyle. "Mobile Suit Gundam Movie I". DVDTalk. Retrieved December 24, 2013. ↑ "Gundam Rock English Cover Album to Ship in Japan". Anime News Network. Retrieved September 16, 2009.